It reads like a cheesy techno-thriller. 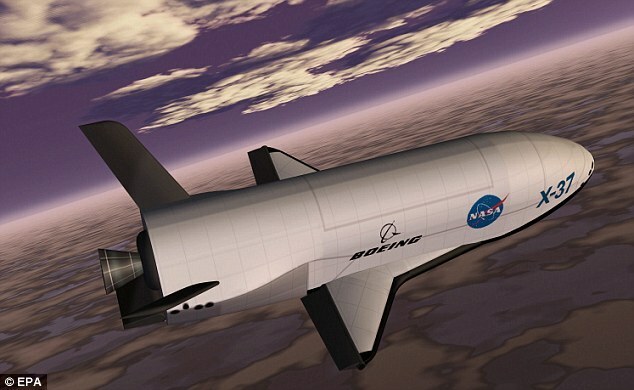 Developed by Boeing’s Phantom Works Division and under the operation of the Air Force Space Command’s 3rd Space Experimentation Squadron, the unmanned craft is a tiny version of the space shuttle. Only 29 feet long and with a wingspan of 14 feet, it will live in low-earth orbit for possibly 270 days before making an automated landing at Vandenberg Air Force Base in California. The location of Mission Control is unknown. The government is not saying what it will do, what experiments will be conducted, what the ultimate point of the thing is, other than it appears to be the U.S. military’s first space plane. Some speculate it’s an extension of predator technology; remote-controlled airborne vehicles that started out as surveillance tools but now carry weaponry and are employed regularly in attacks on terrorist targets along the Pakistan/Afghanistan border. In other words, it’s a potential fast-response space vehicle fairly easily launched and landed. But this mission is said to be just a test of the viability of the craft for later operational programs. The second explanation is that of bureaucratic inertia in military programs which is why the justifications and cost estimates are so obscure and mysterious. Once started, programs are difficult to kill especially when the proponents speak of marvelous capabilities analogous to aircraft style operation down the road. It does have geo-political implications. The Chinese, for example, are likely to see it as the first efforts at U.S. militarization of space and take it as a threat and maybe even a challenge. I’m not really sure what to make of it. A military space race is not necessarily a comforting prospect. On the other hand, presuming this isn’t some bureaucratic boondoggle- maybe it’s us just being really clever and sophisticated in developing the modern tools we need to beat the bad guys. I am assuming, of course, that we will always be the good guys.